The digital revolution is exploding around us, and groundbreaking modern technology is improving all aspects of our lives. In the field of dentistry, we are blending the best of yesterday’s tried and true techniques with the most exciting new methods of today. Here are just a few ways that digital technology is revolutionizing dentistry. Now more than ever before, dentists and patients are able to work together as a truly collaborative team. Digital records require just a tiny fraction of the storage space that paper charts and films needed, allowing dentists to better utilize those areas. Online scheduling lets patients make, change, and cancel appointments as needed. Specialized software allows dentists to consult remotely, in real time, on complex cases. Websites and social media sites encourage dialogue between and among dentists, staff members, and patients. Any patient with an internet connection can easily research his particular condition and the available options for treatment, while online reviews let patients share their experiences with others. One of the most frustrating parts of dental treatment is dealing with lab-created restorations. Impressions are taken and sent out to the lab, and patients must deal with temporary fixes while they wait for the final restoration to come back. 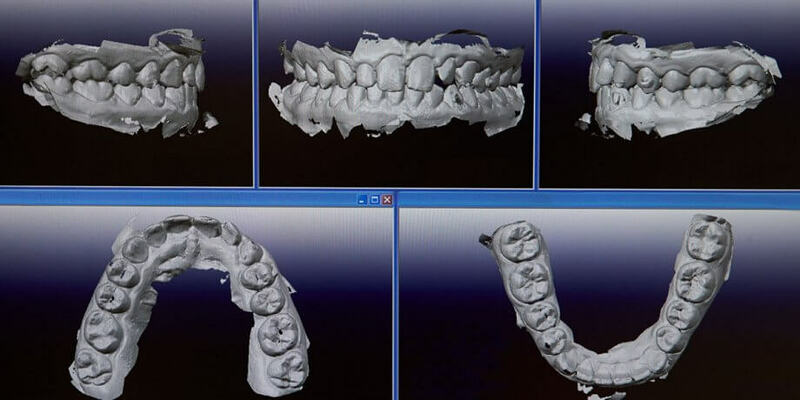 Fortunately, CAD/CAM design and 3-D printing are rapidly changing this process. Dentists who embrace this technology can create many common restorations, such as onlays and crowns, right in the office, and place the final restoration in a single visit. Traditional dental impressions were not much fun for either the dentist or the patient. You probably remember biting into a tray of goop, trying not to gag, and then waiting impatiently as your dentist rocked the hardened material back and forth to get it out of your mouth. Digital impressions are clean, comfortable, and fast. Digital x-rays use less radiation than traditional films. They also require less storage space, and they can easily be magnified and manipulated to zero in on problematic areas of the mouth. Intra-oral cameras take digital photos that can be used in tandem with digital x-rays for better diagnostics. If your dentist needs to take a closer look at your mouth, there are now numerous painless digital scanning options. Optical scanners and digital color maps are used to improve the esthetics of dental restorations by more precisely matching them to your existing teeth. Electronic sensors evaluate the way your teeth come together. Cone beam CT scanning creates a highly detailed 3-D map of your unique oral anatomy, vastly improving the precision with which dental implants are placed. Believe it or not, many implant dentists place dental implants into their patients’ jaws by simply “eyeballing it”. More technologically advanced dental offices place dental implants using surgical guides. With this technique, specialized software is used to create custom surgical guides. These guides direct the exact location, angle, and depth of each implant placement. The use of the guide increases the accuracy, efficiency, safety, and predictability of the procedure. Digital technology cannot and should not replace reasoned, evidence-based dentistry. However, when properly used, digital tools are truly creating better, safer, and less painful dental procedures.